We conducted our field work on March 24, 2014 on a portion of the Blacksmith Fork River outside Millville and on Nick Bouwes' (a.k.a. Buster) property. The data were collected in the UTM Zone 12 North projection with a WGS84 Datum. A base station was set up over an unknown point (BM401) and a here fix was used to conduct the rtkGPS survey from that location. Temporary rtkGPS coordinates were acquired for BM402 and BM403, and these were used for the total station portion of the survey. The static GPS base observations at BM401 were post-processed in OPUS and transformed to UTM Zone 12N NAD 83. All total station and GPS raw data was cleaned and adjusted according to the OPUS adjustment to BM401 in Leica GeoOffice. The above files represent the adjusted observations. We used a Hydro.fmp12 FileMaker Go App developed by Nick Weber to collect velocity, depth and flow data at cross sections as well as the locations and attributes of 'shear zones'. A Marsh McBirney flow meter was used to measure velocity and a Ricky Hydrologic topsettng rod was used to measure depths. All observations were manually recorded in the FileMaker Go App. 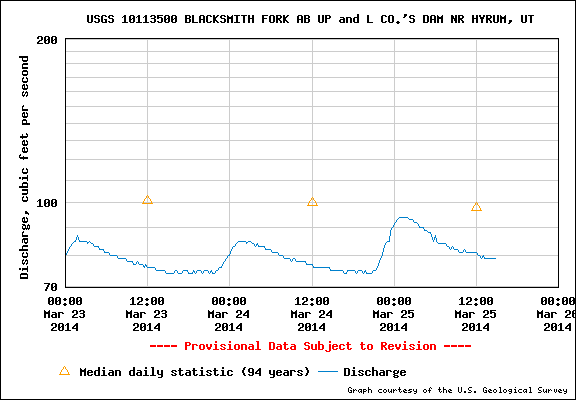 The flow gage upstream on Blacksmith Fork (USGS 10113500) for the date of the survey (March 24th) and few days prior.